This is the post I did not want to write. It has taken every ounce of my strength to type. Here it is: Ethelbert’s story. At about 11pm a week ago, I was alarmed to hear Ethel coughing. It was a strange cough, not one I’d heard before, almost as if she had something caught in her throat. Thinking she was going to throw up a giant furball, I grabbed some kitchen towel and knelt down beside her. She wasn’t sick. What came from her mouth was a small amount of what looked like white, frothy spit. She panted a couple of times, then looked up at me. Having reassured her, I cleaned it up and left her as she curled up again and dozed off. Feeling concerned that something wasn’t right, I made up my bed for the night on the settee so that I could keep a close eye on her. Yet I couldn’t sleep. 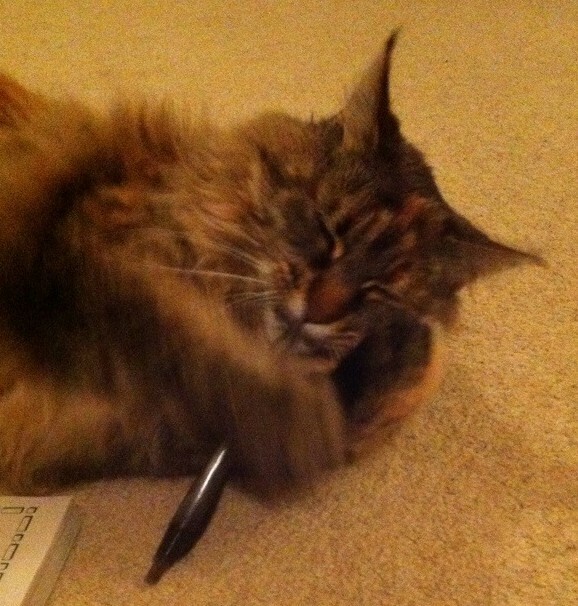 The cough was strange, but Ethel had been fine during the day: eating, drinking and she had even executed a manic dash sideways round the lounge, bouncing on her paws whilst I made some Halloween party invitations. That had raised a chuckle, until she landed in the middle of my decorations and scattered them everywhere. A normal day then. So why was I worried? At 3am I heard Ethel cough again, the same as before but for longer. My heart leapt into my mouth. I found her on the lounge floor, coughing and wheezing. Bubbles of white saliva had formed round her mouth. In a panic I rang the emergency vet, who advised me to bring her immediately to the veterinary hospital. I threw on some clothes, grabbed the carrier and went to gently lift my beautiful cat. She gave a low groan, a base animalistic noise I’d never heard before. She seemed to be in severe pain round her abdomen again. I don’t remember much of the 10 minute drive to the hospital, only that Ethel was completely silent in her carrier. No serenading, no swearing, just silence. The vet unlocked the front door as we arrived and she ushered us inside. The bright lights in the consulting room made it look stark and clinical. I blinked hard several times, to try and adjust my eyes. The vet opened the front of the carrier and dragged Ethel out. It pleased me to see the fight in her, however small; her reluctance to exit the carrier gave me a flicker of hope. I bent down and cupped Ethel’s face in my hands, kissing her soft nose lightly and reassuring her, as the vet listened to her chest. She scooped up my precious cat and swept out of the room. “I daren’t handle her any more otherwise we stand the risk of losing her. Her lungs are completely full; it might be pneumonia, I don’t know” she called to me, and with that she left. I stood alone in the reception area, completely stunned. I could hear the blood pounding in my ears, in contrast to the deathly silence of the empty surgery. I have no idea how long the vet was gone, but when she returned her face was grave. I was allowed to see her before I left, but I couldn’t touch her. She was in a sealed unit. I could hear the hiss of the oxygen being pumped in. Ethel was sitting facing the far corner, her head tilted upwards, eyes closed. Her body was heaving in and out with each breath that she struggled to take. I drove home in a daze. It was like a bad dream from which I could not wake. I lay down on the settee in the lounge but didn’t sleep, my ‘phone clutched nervously in my hand. “What…? ?..” I managed to stutter. I thought I was going to be sick. I couldn’t speak. Each time I opened my mouth, no sound came out. “Yes please,” I uttered in a choked voice. I hung up the ‘phone and stared into the darkness. All I could hear was the impatient ticking of the clock. This really had to be a bad dream, a nightmare. I shook my head. No. No, not our beautiful Ethelbert. I went to find my husband, and told him the events so far. He just sat and looked at me. I drove back to the vet in silence. The roads were starting to come to life as people woke up and began their journeys to who knows where. The vet once again unlocked the door and let me in. Her face was stoic, sombre, resigned. She placed a sheet of paper before me that she asked me to sign. When she passed me the pen, my hand shook. Try as I might, I couldn’t place the pen on the paper. Several times I tried, each time I failed. Then the tears came, an avalanche, unstoppable. I started to sob uncontrollably, leaving the poor vet to grab a large box of tissues and console me. I couldn’t read the writing on the page through the tears, but somehow I took a deep breath and signed it. The vet ushered me to the operating room, where my special girl lay stricken on a table. I gasped in shock at the sight before me. She was laid flat on her tummy, all four legs splayed out at the sides. There was an IV line coming from her front paw and her little face, usually so proud and lion-like, was pushed into an oxygen mask. Her eyes were glazed but only half-open. But the worst thing was the noise: her breathing was coming out in loud rasps, every breath a complete struggle. “Oh what on earth…?” I gasped. “What’s happened to you? Oh baby….” I sat down beside her, the tears again falling freely, this time in silence. The vet placed her hands under Ethel’s front legs and gently moved her over towards me. Ethel made a strange noise, not one I’d ever known before, one I felt rather than heard. I held her on my knee and nuzzled her head. I felt her warmth spread into my arms. “We all love you so very, very much,” I sobbed. “Are you ready?” asked the vet. It was then that I made the hardest decision of my entire life: a decision not for me, nor for our family or our boys. It was a decision just for Ethel, our beautiful, treasured cat. A decision made with love, pure and simple, but one that I will have to live with for the rest of my life. The vet placed the needle in Ethel’s front leg, and she slipped away so quickly but peacefully in my arms, my kisses easing her passage, tears dampening her head. “Sleep tight,” I whispered, squeezing my eyes shut in immense pain. The vet left us and I sat with Ethel for some 30 minutes or so: alone, bereft, in disbelief. I hugged her and kissed her, smelled her. She didn’t smell like our Ethel, but smelled instead of antiseptic and medication. Still, I held on to her. It broke my heart even further trying to explain to our boys what had happened. How do you tell your children that their beloved cat has died not from old age or illness, but from being hit by a vehicle some 23 days ago? She must have been in unbearable pain for all that time. Our youngest son was inconsolable. We adopted Ethel when our boy was 6 months old, so they had grown together. She treated him like a fellow kitten, not a human. Their relationship was unique. When the sobs stopped wracking his body, he turned his head and looked up at me. I will never forget the hurt, misery and utter pain deep in his eyes. 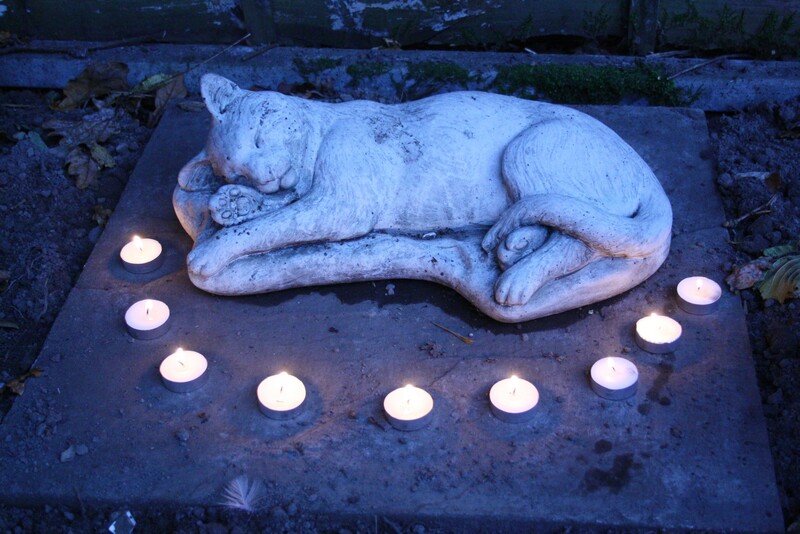 We buried Ethel in the garden next to Blodwen, the much-loved cat we had before her. 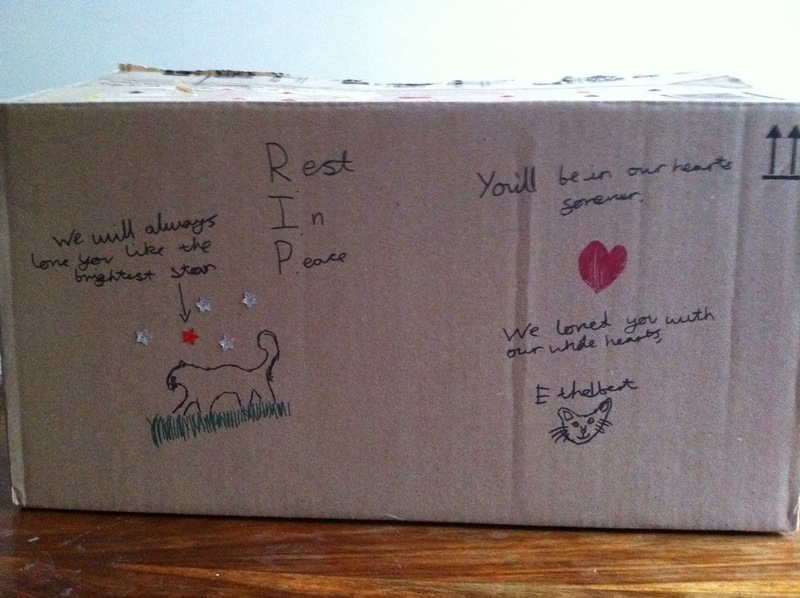 Our youngest son decorated a cardboard box in which to bury his special furry pal. After a simple ceremony, we all stood round the grave, united in our grief, silent and heartbroken. We lit some tealights which we placed on the grave. Our youngest son kept a graveside vigil long after we’d all made our way back inside: a small boy trying to come to terms with the brutal loss of his first pet. 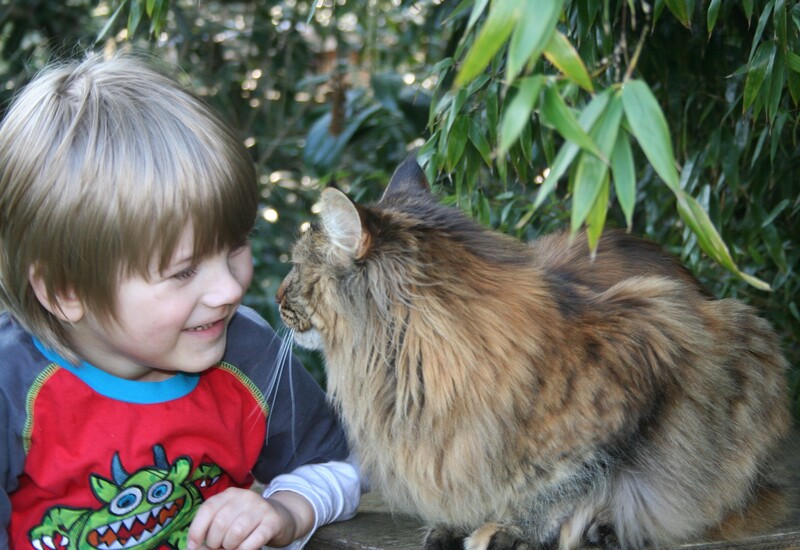 Except that she wasn’t just a ‘pet’ – she was a member of our family, a little person in a fur coat, full of attitude and mischief. We miss her more than words could ever convey. Speaking to our vet a few days later, it appears that Ethel was most likely hit by a cyclist. The major abdominal trauma yet lack of external injuries is a classic result of this kind of collision. 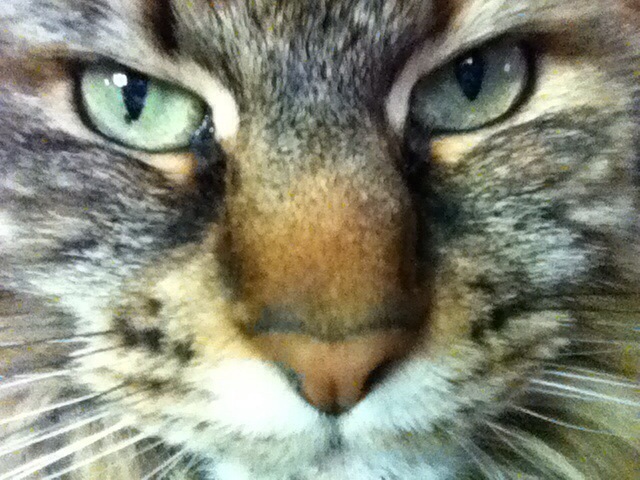 How someone can hit a cat and just ride off leaving them stricken, I will never know. There are some heartless people out there in the world. Yet the worst feeling is that she could have been saved. Had that cyclist owned up to the collision, our precious cat would have had a good chance of still being here. She could have received the correct emergency treatment, rather than antibiotics and painkillers for some mystery virus. We live down a little dirt track along the towpath of a canal. There are only 5 houses down here, surrounded by woodland. Ethel was the only cat in our little neighbourhood: a huge cat with very distinctive markings. She was so well-known, almost a local celebrity. Yet none of that mattered to a speeding cyclist, too busy to stop and tell someone what they had done. We are all struggling to cope with this. I can’t eat, can’t sleep. Each time I close my eyes, I see her face and relive all the events of the morning she died. What an awful way to go. 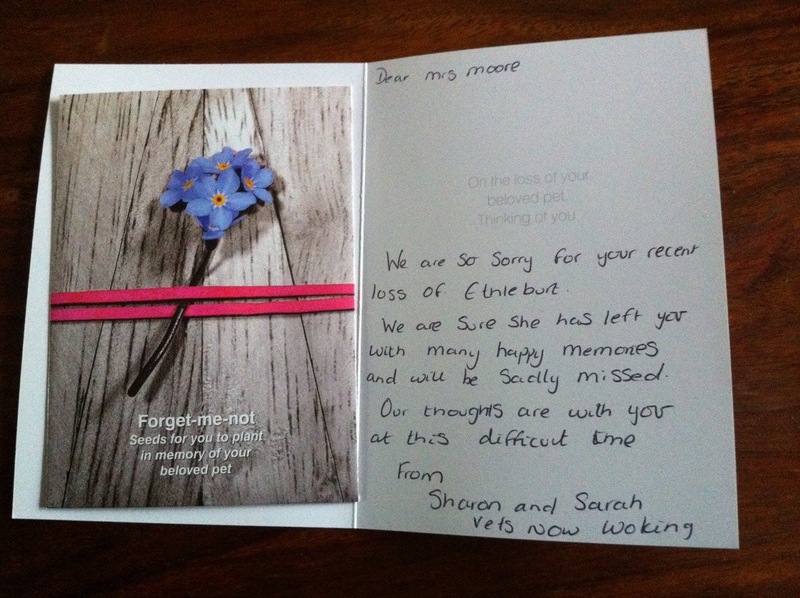 A couple of days ago I received a card from the emergency team who tried to save Ethel’s life. Enclosed in the card was a packet of forget-me-not seeds to plant round her grave. Although upset, I was touched at such a lovely thought, and a very fitting one too. 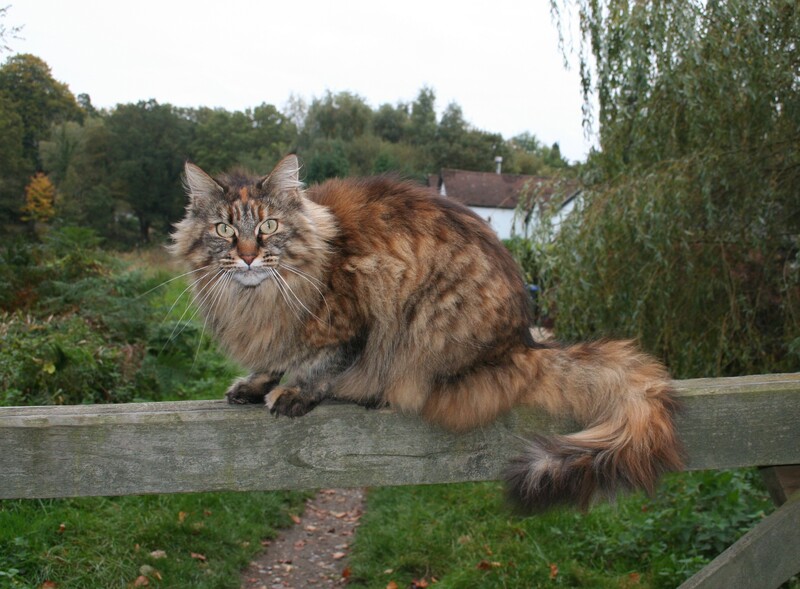 For we never will forget our beautiful Ethelbert, the original chuffin cat. I am shedding tears once again. Can hardly see to type. I have been in that position more than once, and it hurts like crazy. If only…..there are too many if onlys in this world. She was beautiful, and from wha you have told us often, one if a kind, with attitude. I hope the hurt will fade with time, but not yet. Pkease light a candle for me. Thanks Evelyn. It does indeed hurt way too much. Thanks, Lee. I’m sure we will. I read this in the waiting room at the chiropractors- tears streaming down my face. I am so sorry you had to let your beloved fur-baby go but you know you did the right thing. Don’t beat yourself up at not being a mindreader- Ethelbert knows you loved her. I still blame myself for not getting Tinkie to the vet sooner- it’s 2 years on and I still haven’t been able to face getting another fur-baby.